Start Dieting with Nutrition and a Easy Step-by-Step Meal Plan For Women’s Dieting. Women’s Dieting, We have all been told to eat our fruits and vegetables and to drink plenty of water … rather we like it or not these food groups are the human bodies most valuable ingredients. Water…The human brain contains up to 70% water. The human body is composed with up to 60% water meaning there are high percentages of water in Muscle tissue,Blood cells , Body Fat and our bones. . Water is the key to controlling our body temperature as well as digesting food. You should drink up to 2.4 liters of water a day to replace water lost daily. Fruits and Vegetables… Vitamins and minerals and some metals are required to help our bodies work properly. Fruits and vegetables contain these vital properties like calcium, Iron, Potassium, and zinc. Such vitamins and minerals create energy help boost your immune system, Build strong bones and will help fight against Cancer, Diabetes and disease. As yo can see women’s Dieting is important. Dieting or Eating right , Nutrition and Exercise is key for an affective women’s Dieting Plan. Unfortunately in today’s society the term dieting has taken a wrong turn . When someone says there on a diet it means they have probably stopped eating. In this case Women’s Dieting dieting has become harmful to your health. The thing we fail to realize is that instead of dieting we should be eating healthy foods with nutritional value every day as part of our lifestyle . Leaning to eat with structure is key. We know what foods are good for us and we know what foods are bad for us. Eating healthy can be achieved with simple planning and practice. Most of us are on the go 24/7 which is why we end up ordering pizza and eating fast food. Following a meal plan and planning ahead will help know what your going to eat the day before. Simple meal Plan for daily nutrition and vital needs For Women’s Dieting. The key to this Meal plan is to eat 3 small nutritious meals a day and two healthy snacks. If your are trying to loose a substantial amount of weight you should consume less calories than you burn. The main focus is to improve on daily nutrition, exercise and recreational fitness. Choose one of each healthy choice as a meal or snack every day. Breakfast is the most important meal of the day , choose one of these items to eat for breakfast or a snack . Create your grocery list weekly to keep fresh fruits and vegetables available. Whole-Grain or Multi-grain grain cereal. Choose brands like kashi, or Fiber 1 , You can add fruits and Nuts like Strawberries,Blueberries and almonds . Watch you fat content by using 1% or 2% milk. Whole-Grain/Multi-Grain Waffles or Pancakes. Choose light syrup and eat a smaller portion you can also add a side of fruit or berries. Just remember to watch your sugar content and calories… Sugar stores fat. Eggs, Turkey Bacon, Turkey Sausage and Chicken . Eggs and Turkey will provide you with the Protein and Amino acids that help you build muscles. But do not worry you will not become a body builder just because you eat protein. Your body needs protein to produce muscle. Oatmeal, Yogurt,Fruit, You can also ad fresh fruit to yogurt and oatmeal if you are on the go these options are good choices. You can make a fruit cup or parfait. Nuts, Fruits, and Snacks. Almonds, Walnuts, and Cashews, Are easy snacks that can be taken any where. You can also snack on fruits, Berries and Vegetables. Carrots, String beans ect. Bananas, Apples, Peaches and Plums ect. Any fresh fruits. Snack Bars and Shakes. Try to find fruit and Nut bars they are crunchy and provide that sweet taste that make for a satisfying snacking . Thanks to the nuts and fruit, they also contain fiber and protein, so they stave off between-meal hunger. Shakes made with fruits and berries are a great snack . Be sure to use 1% milk or low fat yogurt and try not add extra sugars. More Snacks. Natural Peanut butter, Low-fat cottage cheese and small salads . Try not to use creamy dressings like ranch . Use oil and vinegar and vinaigrette dressings. Turkey Substitute . Turkey burgers and turkey breast are great substitutes for beef . Turkey has less fat and grease than ground beef depending on what kind of ground beef that you purchase. Choose ground lean turkey and season it yourself. Meat and Fish. Chicken, Steak , Pork and Fish should be served in 5 to 6oz portions . The preparation of the meat should be sauteed, Grilled, Steamed or Baked. Pasta and Sides. Try to eat whole wheat pasta in small portions with light sauce. Sides, Try to eat up to 4 serving of vegetables a day. Saute fresh vegetables in olive oil with light salt. You can eat salads with with the right choice of dressings. 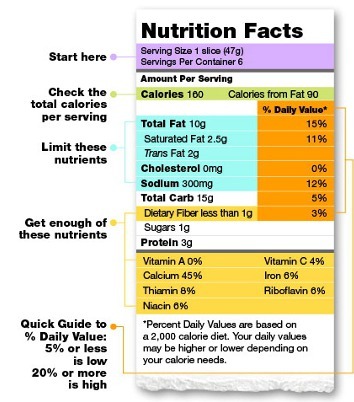 Learn how to read the nutrition facts on the back of all the food that you purchase. Women’s Dieting relies on reading and learning nutrition. Enjoy our easy to use Women’s Dieting Plan.